اقتصاد سیاسی ایران ساز و کارها و چشم اندازها Iran's Political Economy, Mechanisms and Prospects - Part 1 دکتر محمد مالجو در این مجموعه درسگفتارهای کوتاه با شناسایی شش حلقه‌ی کلیدی در زنجیره‌ی انباشت سرمایه در اقتصاد ایران و صورتبندی شش منازعه‌ی کلیدی در صحنه‌ی اقتصاد سیاسی ایران و واکاوی شش بحران کلیدی حاصله در جامعه‌ی ایران نشان خواهد داد که تعمیق مناسبات طبقاتی سرمایه‌داری به موازات تضعیف تولید سرمایه‌دارانه چگونه بحران کنترل‌ناپذیری اقتصاد ایران را فراهم می‌سازد. 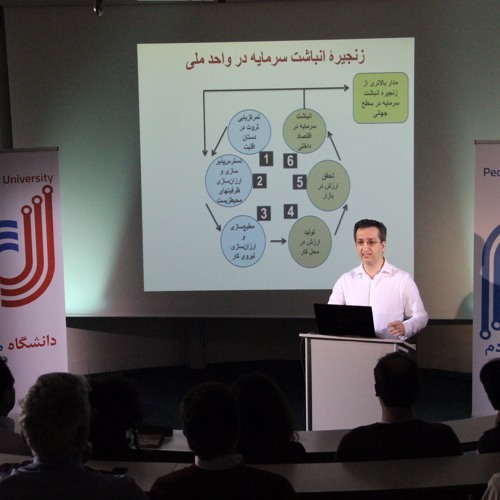 اطلاعات بیشتر: http://p-uni.com/2015/12/14/maljoo1/ Dr. Maljoo was born in Tehran in 1972 and received his PhD in Economics from the University of Tehran in 2005. He was Lecturer at the Faculty of Economics, Allameh Tabataba’i University in Tehran in the period 2006 to 2009. His field of specialisation includes the political economy of Iran in the post-revolutionary period. He has published more than sixty journal articles in Persian and several others in English, German, and French on various subjects. He has also translated several books by Albert O. Hirschman into Persian, including The Passions and the Interests (2000), The Rhetoric of Reaction (2003), Exit, Voice, and Loyalty (2003), Shifting Involvements (2006), Crossing Boundaries (2008), as well as by Charles L. Lindblom’s The Market System (2009) and Karl Polanyi’s The Great Transformation (2012).